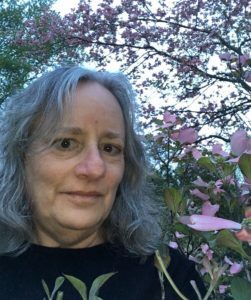 Ilene Roizman with her backyard apple tree. Photo by Ilene Roizman. A year ago, committing to tax resistance felt like jumping off a cliff. There had been a three-year period a few years prior when circumstances allowed me to work so little I wasn’t required to file, and I didn’t, without any hesitation. So when it came time to make not filing a deliberate act of civil disobedience, I had already gotten over the hurdle of breaking from decades of compliance. Still, it wasn’t an easy decision to make. Working as a freelancer means no tax withholding. I’m supposed to put the money aside and actually write a check to the IRS every year. Two years ago, coming off the no-work period, there wasn’t much to send, but if I hadn’t, I wouldn’t have been able to get state-subsidized health insurance. Last year, I couldn’t bring myself to write the check. Instead, I saw an opportunity to join the resistance. In my case, the stakes are low—I have no car, no house, no real assets to speak of—as is my income. Since I’m generally healthy, I’m not terrified by the prospect of losing health insurance, which is supposed to be verified for requalification on my state tax return, which I’m also not filing. For advice, I turned to a dear friend, an activist from way back who lived in a tepee after coming back from Vietnam, went around counter-recruiting with Veterans for Peace at high schools to convince potential military recruits not to believe the government’s lies about the glory of the armed forces, and was arrested with a group of protesters at a nuclear power plant. He knows a thing or two about resistance. He also knows about the War Resisters League, and consequently about war tax resistance, and that led me to the National War Tax Resistance Coordinating Committee. I read pretty much everything on the NWTRCC website, had e-mail exchanges with a few people, and talked to a local long-time tax resister on the phone. I scrutinized “Civil Disobedience” and read works by Gene Sharp, as recommended by my activist son in NYC. I covered a lot of ground in a short period of time and decided there was no turning back. When it came to what to do with the set-aside funds, it felt important to make it local, where smaller amounts can have more impact. “Think global, act local” isn’t just a snappy slogan. Acting at all can seem overwhelming—so many choices, so many ways to get involved, have a voice, make a difference. So many places that need money. In some areas, tax resisters are pooling their diverted tax money and giving large sums to national groups for broader impact. Narrowing the choice to my local community made sense to me. It feels like real direct action. This year, again I’m filling out tax forms for my own record-keeping, but also to have a ready accounting of the numbers should the IRS come calling—and especially to know exactly how much I have to reallocate—it feels like the only possible course of action. I’m still falling off the cliff, just like the perpetually falling ad man in the “Mad Men” opening credits, but it’s somewhat less scary. While I believe the IRS is so overwhelmed, backed up, understaffed, underfunded, and poorly organized that it won’t notice little old me, I can’t count on it. So far I’ve heard nothing from the IRS and I still have my state-subsidized health insurance past the annual renewal date. They may never catch up with me, or I could get a letter in the mail next week. In the meantime, one thing I’ve learned is that it’s important for me to look at it not as I’m not paying my share of taxes, but I’m diverting my tax money. It’s important to remember, and to point out to others, that I’m not keeping the money for myself. But instead of paying it to the government with the now unrealistic expectation that they’ll do what they’re supposed to and use it for the betterment of society, I’m giving it directly to organizations in my local community knowing that the money actually will make a positive difference in people’s lives. That helps to alleviate any dread I might have over a possible run-in with the IRS and makes it much easier to write the checks. I have not paid income tax or filed income tax forms. Instead, as many war tax resisters do, I am redirecting the funds I put aside for taxes to organizations that help people in my local community—organizations that a functional, caring government would be funding instead of the military industrial complex. This is an act of conscience that comes with some personal risk, but I feel, as anyone who engages in nonviolent action against a corrupt government feels, that the potential benefits to society outweigh any risk I might face. While many people around the country are showing their resistance by marching in the streets, or making phone calls and writing letters to their elected representatives, or meeting in groups to educate and motivate, I’ve chosen a quieter form of resistance that, I hope, will directly help people right here in my community.